My husband was out of town all this week on a business trip. We missed him so and I'm so thrilled he's back! I learned a lot about myself during the time he was away. I learned a lot about my son as well. Having a home with two parents is a huge blessing. I often think about single moms. I believe God never gives you more than you can endure, so I always pray that they are surrounded by great helpers. This upcoming week is another week full of adventures in motherhood. My belly is steady growing. I must admit that last time I wasn't impressed with the size of it til mid month 7. This time around, I'm impressed with the sized of it on month 4 :) My older son has been walking while holding to furniture, getting under furniture and he's just interested in everything. Gotta love boys. I'm so excited to find out this baby's gender. We still don't have a consensus about how/when we're gonna find out. My husband is determined to wait for a few hours. I'm determined to find out asap and SCREAM at the doctor's office regardless of the gender - I'm known to be loud. We'll see what will happen. LP got a clean bill of health last week at the doctor's. Glory be to God his ears are so clean there isn't even wax in it. Now on with my ever so slow introduction of new foods. 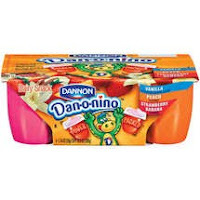 One exciting thing is that I finally found dan-o-nino (danoninho where I come from). It's a baby yogurt which is absolutely delicious. The portions are really small (smaller than yo baby's) so no waste there.